When Tony Fleming designed the classic Fleming 55′ he had two things in mind, Quality and Seaworthiness. From the hull design to the exquisite interior no matter the time or cost he never cut corners. Some 30 years later these qualities stand true today. That is what caught the eye of Burr Yacht Sales. We saw an opportunity to sell a fine vessel with the same eye on perfection that Tony Fleming has. From the electronics down to the stabilizers and even wood finish we use nothing but the best that is offered. When it came time to choose a wood finish we did countless test on various finishes and there was one clear winner. Bristol Finish. The protection it provides and beautiful look it gives to the teak on our Flemings is second to none. 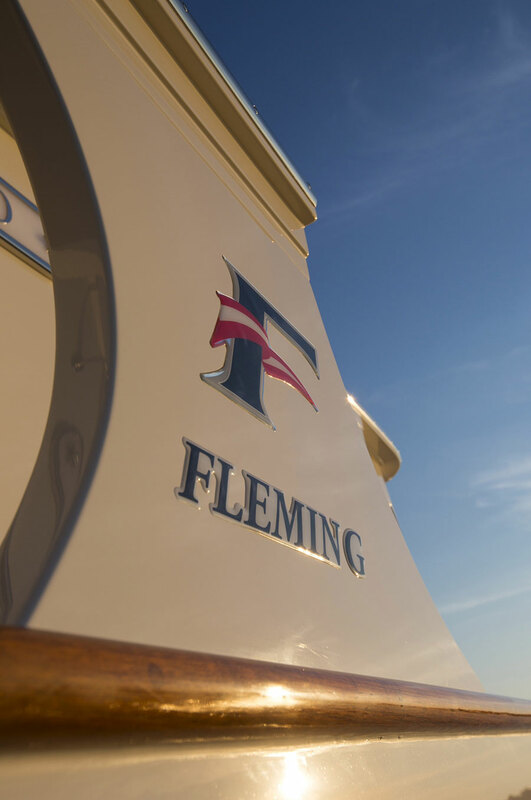 We wanted to choose a finish that would complement the very aspects that define a Fleming and that we did. Burr Yacht Sales has been using Bristol Finish now for many years and will continue to do so. Bare wood- Before doing any sanding it is very important to clean the wood. Either use a wood cleaner or use acetone. We prefer acetone. If wood is older and grey the wood needs to be sanded starting with 80grit to flatten and expose the golden wood underneath. Once all wood is golden and smooth then sand again with 120grit and then finish with 220grit. Note: if a darker wood is desired instead of using stains just stop sanding at 120grit. The wood will be darker then if had been sanded with 220 grit. Do not sand to 320 grit because there is not enough grip on the wood to hold bristol finish or any finish for that matter. We have stripped boats that were final sanded with 320 grit and the finish literally pulls off in sheets. Your first coat can be thinned or put on straight out of the can. Remember if you thin the first coat it will make the wood look even darker. Once the first coat is applied, immediately go back and apply the second coat. At this point the wood will be breathing and you may experience bubbles. Do not stop. After the 2 coat is applied wait an hour and put a third coat on. Wait another hour and put the fourth and final coat on for that day. It is extremely important to do this method because you will have bubble issues if you don’t. You have now sealed the wood. 18 hours is the maximum amount of time you can wait before re coating Bristol finish. On day two you will see a few bubbles here and there and this is normal. Lightly scuff those spots with a red Scotchbrite™ pad and wipe with denatured alcohol. Remember to use denatured alcohol if the top coat is less then 24 hours old. When it is past that time frame use Acetone. Acetone is a excellent wax stripper so if you think you may have a wax invasion then acetone is your friend. Now continue to coat your project but remember to only apply four or less coats on in one day. We like to stop coating after fifteen coats and let cure for three days before sanding. At this point we block wet sand the finish with 320grit sandpaper and get the finish perfectly smooth with no dimples or flaws. After sanding we then do one last final coat. If this sounds like a lot of work, it is. But the final outcome is breathtaking. It may help to do one section at a time. Once that final coat has cured for 2-3 days we begin to block wet sand with 800grit. This sanding shouldn’t take too long because of the 320grit sanding you just did. Once all flaws are worked out with the 800grit continue to wet sand with 1200grit then 1500grit. This is the final sanding and the finish is now ready to be polished. We use 3m perfect-it polish with a machine buffer. After polishing your finish should now look like a sheet of glass that is moulded over your wood. Now is the time to stand back and appreciate what you just accomplished. Make sure to caulk all edges to prevent water intrusion. We encourage you to wax your finish to help protect it. Touch up: First remove all wax on the Bristol finish by using acetone and change rags frequently. Remove all caulking surrounding the finish. If there are yellow spot where wood joints have moved then these spots need to be cut out before applying any finish. Be sure to not cut into the wood or you will see this when you reapply the finish. Once yellow spots are removed, sand the bare wood spots with 220grit. Now scuff the finish with red Scotchbrite™ pads and clean again with acetone. You are now ready to coat. We like to apply 5-6 coats when we are doing touch ups. Once these build up coats are applied we follow the same steps as mentioned above with regards to wet sanding, final coating and polishing. Caulk all edges. Fleming also has a 65′, 78′ and newly released 58′ model that we continue to do this same process on. We want our owners to enjoy their yachts and not have to feel like they have to consistently maintain their finish. We have had our Flemings come back many years after having Bristol applied and they look as good as the day they set sail. We believe in Bristol. We trust Bristol. We choose Bristol.